Credit: Heidi L. Fuchs/Rutgers University-New Brunswick. The warming ocean may cause the larvae of bottom-dwelling snails to hatch earlier in the spring, when waves are larger, potentially impacting their ability to survive and serve as food for other sea creatures. A Rutgers University-New Brunswick study sheds new light on the sensory organs the snail larvae use to feel – and perhaps even hear – whether the water is turbulent or wavy, and improve their odds of being carried to a good habitat where they can settle down as adults. The study, published online in the Proceedings of the National Academy of Sciences, focuses on two species of snail, both of which live along North America's East Coast: eastern mudsnails (Tritia obsoleta), which live in inlets, and threeline mudsnails (Tritia trivittata), which live in the deeper waters of the continental shelf. The inlet-dwelling snails more often experience water that is turbulent but not very wavy. The continental shelf-dwelling snails live in a less turbulent, wavier environment. In experiments, the researchers found that the larvae experienced turbulence as rotation or tilting of the body and sensed waves as acceleration in a straight line. Both signals are detected by a statocyst – a small organ similar to the human inner ear. 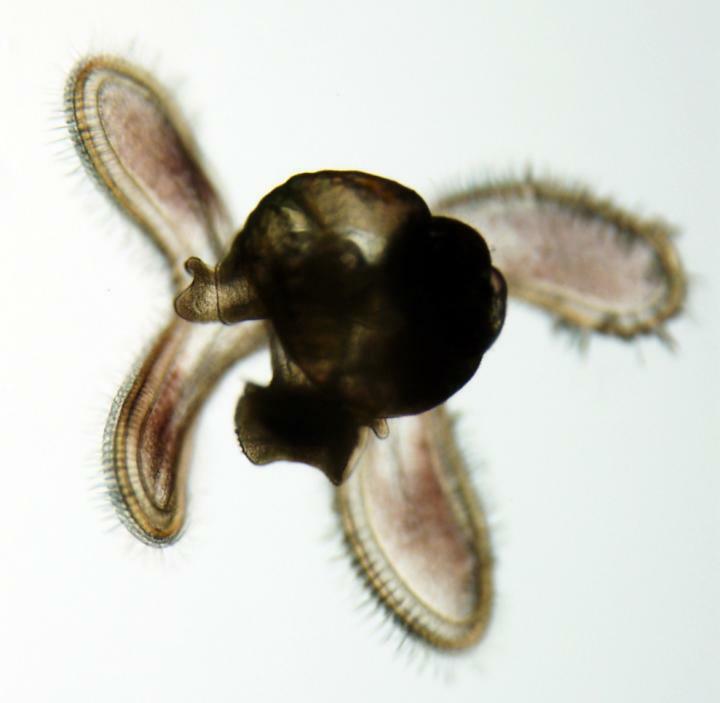 The experiments suggest larvae can detect waves as both motion and low-frequency sound, according to lead researcher Heidi L. Fuchs, an associate professor in the Department of Marine and Coastal Sciences in the School of Environmental and Biological Sciences. When the larvae of both species experience turbulence, they respond either by swimming with more effort or by sinking. Waves triggered a similar, stronger reaction and resulted in upward swimming only in the larvae that dwell in the continental shelf. Swimming upward may allow them to use the shoreward drift of the waves to avoid being carried over the open ocean where they would be lost, Fuchs said. "More than 99 percent of the snail larvae we studied die in transit, partly because they're carried away from any place where they could survive," Fuchs said. "Probably one in 20,000 of these larvae survives through adulthood, so it's critical that survivors wind up in a tolerable habitat." But climate change complicates things. Over the last few decades, these larvae probably have been hatching earlier and exposed to larger waves, which could push them into shallower, warmer water that is less tolerable to adults. How this affects their population is a subject of a new study.